A PET scan will produce a three-dimensional, colour image of your body, which will show how body tissues are working and also what they look like. It can be used to help diagnose cancers and it can help doctors tell the difference between scar tissue or an active cancer in the body. Identify the difference between scar tissue and tissue that is cancerous. 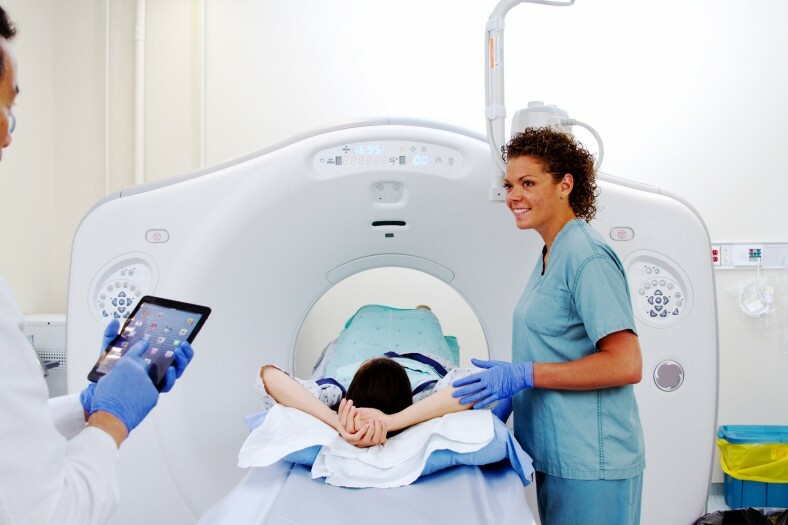 What is a PET-scan and how does it work? PET scans are becoming more widely used in the NHS but they are still very expensive and only a few specialist hospitals in the UK have one. Many hospitals will have their PET scanner in the Nuclear Medicine department, which will have special facilities to contain the radiation. PET scanners have a flat bed with a large, circular scanner at one end. Patients may be asked to fast for about 4 to 6 hours prior to your screen then a radiographer will give you an injection of a very small amount of a harmless radioactive substance (radiotracer) into a vein. You will need to wait for about 1 hour while the radiotracer spreads through your body. You will then be asked to lie down on the flat bed of the scanner unit, which will move through the circular scanner at the end. The radiographer will control the scan from outside the room and they will be able to see and talk to you. You will need to stay as still as possible while the scan is taking place. The amount of radiation is very small (no more than you have during a normal x-ray) and it stays in your body for only a few hours. The radiotracer gives off particles called positrons that release gamma waves (a form of radiation), which can be detected by the special camera in the PET scanner. The scan will take an image of the radiotracer in the body. The most common drug used is the radioisotope fluorine-18 in combination with glucose (together called FDG or fluorodeoxyglucose). This is a radioactive form of glucose. When FDG-18 is injected into your body it travels to places where glucose is used for energy. Cancer tumours use glucose in a different way to normal tissue, and the PET scan shows these differences and can tell doctors whether cancer is present. Sometimes a CT scan can show that there may be cancer left after treatments such as chemotherapy. A PET scan can confirm whether or not it is active cancer or just scar tissue left over as a result of treatments. There are usually no side effects from this type of scan but it can take up to an hour for the procedure and some people find it difficult to lie still for an hour.